April brought about hot tub time, but getting Allison in and out of the tub was very problematic. 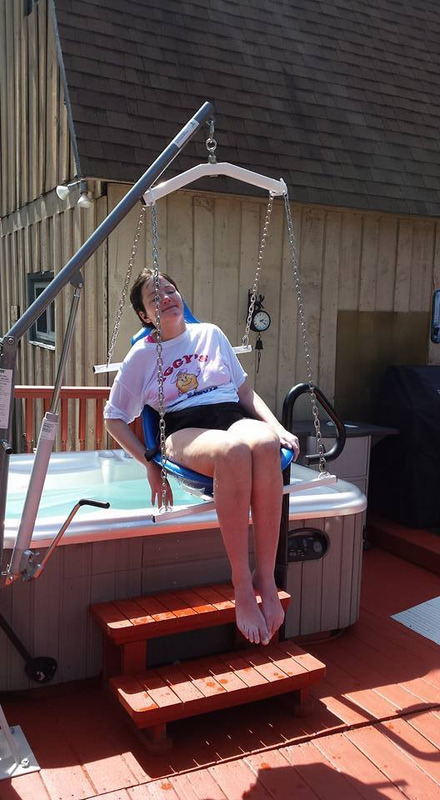 I found a lift which we could use which would allow Allison to enjoy her hot tub. With the advent of Spring hopes were rising for better times. Allison was in a good mood and sleeping through the night. No 911 calls had been made for months.The new hot tub lift was working out great. Rides in the Miata were not happening because we couldn’t easily get Allison in or out of it. Allison was greatly enjoying her rapidly expanding DVD collection and of course, still playing Virtual Families. By June it was time to go back to see Dr. Rosas at MGH. This time nothing bad happened. The visit was uneventful and perhaps even perfect. We scheduled another visit for the Fall. Brian Wilson of the Beach Boys was coming to Tanglewood that summer. Of course we had to go. Allison was very weak but with Rob’s help we made the trip! Allison had a wonderful time and other than of a great concert, there were no stories to tell. It turns out that this would be her last concert. Again Bob and Midge could not visit as Bob’s health was failing. He died in November. We celebrated Allison’s 34th birthday in August. We did not make the Fall visit to MGH as Allison could no longer travel. Dr. Rosas did stay in touch with us and continued to offer her guidance. Chapter Twenty-Two: What Heart Attack?